William Henry Harrison (February 9, 1773 â" April 4, 1841) was the ninth President of the United States (1841), an American military officer and politician, and the last President born as a British subject. He was also the first president to die in office. He was 68 years, 23 days old when inaugurated, the oldest president to take office until Ronald Reagan in 1981. Harrison died on his 32nd day in office of complications from pneumonia, serving the shortest tenure in United States presidential history. His death sparked a brief constitutional crisis, but its resolution settled many questions about presidential succession left unanswered by the Constitution until the passage of the 25th Amendment in 1967. He was the grandfather of Benjamin Harrison, who was the 23rd President from 1889 to 1893. Before election as president, Harrison served as the first territorial congressional delegate from the Northwest Territory, governor of the Indiana Territory and later as a U.S. representative and senator from Ohio. 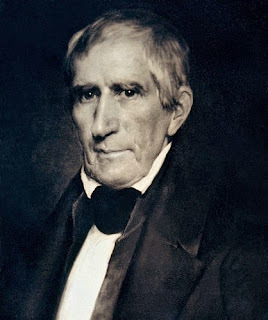 He originally gained national fame for leading U.S. forces against American Indians at the Battle of Tippecanoe in 1811, where he earned the nickname "Tippecanoe" (or "Old Tippecanoe"). As a general in the subsequent War of 1812, his most notable action was in the Battle of the Thames in 1813, which brought an end to hostilities in his region. This battle resulted in the death of Tecumseh and the dissolution of the Indian coalition which he led. After the war, Harrison moved to Ohio, where he was elected to the United States House of Representatives. In 1824 the state legislature elected him to the U.S. Senate. He served a truncated term after being appointed as Minister Plenipotentiary to Colombia in May 1828. In Colombia, he spoke with SimÃ³n BolÃ­var urging his nation to adopt American-style democracy. William Henry Harrison was born February 9, 1773, the youngest of Benjamin Harrison V and Elizabeth Bassett's seven children. They were a prominent political family who lived on Berkeley Plantation in Charles City County, Virginia. He was the last president born as a British subject before American Independence. His father was a planter and a delegate to the Continental Congress (1774â"1777), who signed the Declaration of Independence. The senior Harrison was governor of Virginia between 1781 and 1784, during and after the American Revolutionary War. William's older brother Carter Bassett Harrison was elected to the United States House of Representatives from Virginia. In 1787, at the age of 14, Harrison entered the Presbyterian Hampden-Sydney College. He attended the school until 1790, becoming well-versed in Latin and basic French. He was removed by his Episcopalian father, possibly because of a religious revival occurring at the school. He briefly attended a boys' academy in Southampton County. He allegedly was influenced by anti-slavery Quakers and Methodists at the school. Angered, his pro-slavery father had him transfer to Philadelphia, Pennsylvania, for medical training, where Harrison boarded with Robert Morris. The young Harrison entered the University of Pennsylvania in 1790, where he studied medicine under Dr. Benjamin Rush. As Harrison later told his biographer, he did not enjoy the subject. Shortly after Harrison started these studies, his father died in 1791, leaving him without funds for further schooling. Eighteen years old, Harrison was left in the guardianship of Morris. Governor Henry Lee of Virginia, a friend of Harrison's father, learned of Harrison's situation after his father's death and persuaded him to join the army. Within 24Â hours of meeting Lee, Harrison was commissioned as an ensign in the U.S. Army, 1st Infantry Regiment at the age of 18. He was first assigned to Cincinnati in the Northwest Territory, where the army was engaged in the ongoing Northwest Indian War. General "Mad Anthony" Wayne took command of the western army in 1792 following a disastrous defeat under its previous commander, Arthur St. Clair. Harrison was promoted to lieutenant that summer because of his strict attention to discipline, and the following year he was promoted to serve as aide-de-camp. From Wayne, Harrison learned how to successfully command an army on the American frontier. Harrison participated in Wayne's decisive victory at the Battle of Fallen Timbers in 1794, which brought the Northwest Indian War to a successful close for the United States. After the war, Lieutenant Harrison was one of the signatories of the Treaty of Greenville in 1795, which forced cession of lands by Native Americans and opened much of present-day Ohio to settlement by European Americans. After the death of his mother in 1793, Harrison inherited a portion of the family's estate, including about 3,000 acres (12Â km2) of land and several slaves. Still in the army at the time, Harrison sold his land to his brother. In 1795 at the age of 22, Harrison met Anna Tuthill Symmes, of North Bend, Ohio. She was a daughter of Anna Tuthill and Judge John Cleves Symmes, a prominent figure in the state and former representative to the Congress of the Confederation. When Harrison asked the judge for permission to marry Anna, he was refused. The pair waited until Symmes left on business, then they eloped and married on November 25, 1795. They married at the North Bend home of Dr. Stephen Wood, Treasurer of the Northwest Territory. The couple honeymooned at Fort Washington, as Harrison was still on duty. Two weeks later, at a farewell dinner for General "Mad" Anthony Wayne, Symmes confronted his new son-in-law for the first time since the wedding, sternly demanding to know how Harrison intended to support a family. Harrison responded "by my sword, and my own right arm, sir." Afterward, still concerned about Harrison's ability to provide for Anna, Symmes sold the young couple 160 acres (65Â ha) of land in North Bend. Not until his son-in-law had achieved fame on the battlefield did Symmes come to accept Harrison. Together the Harrisons had 10 children. Nine lived into adulthood and one died in infancy. Anna was frequently in poor health during the marriage, primarily due to her many pregnancies. She nonetheless outlived William by 23 years, dying at age 88 on February 25, 1864. In a biography of Walter Francis White, the noted African-American civil rights leader and president of the NAACP in the mid-20th century, historian Kenneth Robert Janken notes that White's mother Madeline Harrison traced some of her mixed-race white ancestry to Harrison in Virginia. Her family holds that Dilsia, a female slave belonging to William Henry Harrison, had six children by him, born into slavery. Four were said to be sold to a planter in La Grange, Georgia, including a daughter, Marie Harrison. Marie was Madeline's mother. Harrison resigned from the army in 1798 and began campaigning among his friends and family for a post in the Northwest Territorial government. With the aid of his close friend, Secretary of State Timothy Pickering, he was recommended to replace the outgoing Secretary of the Territory. Harrison was appointed to the position, and frequently acted as governor during the absences of Governor Arthur St. Clair. Harrison had many friends in the elite eastern social circles, and quickly gained a reputation among them as a frontier leader. He ran a successful horse-breeding enterprise that won him acclaim throughout the Northwest Territory. He championed for lower land prices, a primary concern of settlers in the Territory at the time. The U.S. Congress had legislated a territorial land policy that led to high land costs, a policy disliked by many of the territory's residents. When Harrison ran for Congress, he campaigned to work to alter the situation to encourage migration to the territory. In 1799, at age 26, Harrison defeated the son of Arthur St. Clair and was elected as the first delegate representing the Northwest Territory in the Sixth United States Congress. He served from March 4, 1799, to May 14, 1800. As a delegate from a territory, not a state, he had no authority to vote on bills but was permitted to serve on a committee, submit legislation, and debate. As delegate, Harrison successfully promoted the passage of the Harrison Land Act. This made it easier for the average settler to buy land in the Northwest Territory by allowing land to be sold in small tracts. The availability of inexpensive land was an important factor in the rapid population growth of the Northwest Territory. Harrison also served on the committee that decided how to divide the Northwest Territory. The committee recommended splitting the territory into two segments, creating the Ohio Territory and the Indiana Territory. The bill, 2Â Stat.Â 58, passed and the two new territories were established in 1800. As governor, Harrison had wide ranging powers in the new territory, including the authority to appoint all territorial officials, and the territorial legislature, and to control the division of the territory into political districts. A primary responsibility was to obtain title to Indian lands. This would allow European-American settlement to expand and increase U.S. population to enable the region to gain statehood. Harrison was eager to expand the territory for personal reasons as well, as his political fortunes were tied to Indiana's rise to statehood. In 1803 President Thomas Jefferson granted Harrison authority to negotiate and conclude treaties with the Indians. Harrison supervised the development of 13 treaties, through which the territory bought more than 60,000,000 acres (240,000Â km2) of land from Indian leaders, including much of present-day southern Indiana. The 1804 Treaty of St. Louis with Quashquame led to the surrender by the Sauk and Meskwaki of much of western Illinois and parts of Missouri. This treaty and loss of lands were greatly resented by many of the Sauk, especially Black Hawk. It was the primary reason the Sauk sided with The United Kingdom during the War of 1812. Harrison thought the Treaty of Grouseland in 1805 appeased some of the issues for Indians, but tensions remained high on the frontier. The 1809 Treaty of Fort Wayne raised new tensions. Harrison purchased from the Miami tribe, who claimed ownership of the land, more than 2,500,000Â acres (10,000Â kmÂ²) of land inhabited by Shawnee, Kickapoo, Wea, and Piankeshaw peoples. Harrison rushed the process by offering large subsidies to the tribes and their leaders so that he could have the treaty in place before President Jefferson left office and the administration changed. The tribes living on the lands were furious and sought to have the treaty overturned but were unsuccessful. Tecumseh launched an "impassioned rebuttal", but Harrison was unable to understand his language. A Shawnee friendly to Harrison cocked his pistol from the sidelines to alert Harrison that Tecumseh's speech was leading to trouble. Some witnesses reported that Tecumseh was encouraging the warriors to kill Harrison. Many of the warriors began to pull their weapons, representing a substantial threat to Harrison and the town, which held a population of only 1,000. Harrison pulled his sword. Tecumseh's warriors backed down after the officers had pulled their firearms in defense of Harrison. Chief Winnemac, who was friendly to Harrison, countered Tecumseh's arguments and told the warriors that since they had come in peace, they should return home in peace. Before leaving, Tecumseh informed Harrison that unless the treaty was nullified, he would seek an alliance with the British. After the meeting, Tecumseh journeyed to meet with many of the tribes in the region, hoping to create a confederation to battle the United States. The press did not cover the battle at first, and one Ohio paper misinterpreted Harrison's dispatch to Eustis to mean he was defeated. By December, as most major American papers carried stories on the battle, public outrage over the Shawnee attack grew. At a time of high tensions with the United Kingdom, many Americans blamed the British for inciting the tribes to violence and supplying them with firearms. In response, Congress passed resolutions condemning the British for interfering in American domestic affairs. A few months later, the U.S. declared war against UK. The outbreak of war with the British in 1812 led to continued conflict with Indians in the Old Northwest, and Harrison was kept in command of the army in Indiana. After the loss of Detroit, General James Winchester became the commander of the Army of the Northwest. He offered Harrison the rank of brigadier general, which he refused, as he wanted sole command of the army. President James Madison removed Winchester and made Harrison the commander on September 17, 1812. Harrison inherited an army of fresh recruits, which he endeavored to drill. Initially he was greatly outnumbered by the British with their Indian allies. In the winter of 1812â"13, Harrison constructed a defensive position at the rapids on the Maumee River in northwest Ohio. He named it Fort Meigs in honor of the Ohio governor, Return J. Meigs, Jr.
After receiving reinforcements in 1813, Harrison took the offensive. He led the army north to battle the Shawnee and their new British allies. He won victories in Indiana and Ohio and recaptured Detroit, before invading Canada. He defeated the British at the Battle of the Thames, in which Tecumseh was killed.The Battle of the Thames was considered one of the great American victories in the war, second only to the Battle of New Orleans. After the war ended, Congress investigated Harrison's resignation. It determined that he had been mistreated by the Secretary of War during his campaign and that his resignation was justified. They awarded Harrison a gold medal for his services during the War of 1812. Harrison had returned to North Bend after he was replaced as Governor of Indiana Territory, and he enlarged the log cabin on his farm and returned it to cultivation. In 1814 he was appointed by President James Madison to serve as a commissioner to negotiate two treaties with the Indian tribes in the Northwest. Both treaties were advantageous to the United States as the tribes ceded a large tract of land in the west. It provided more land for European-American purchase and settlement. Appointed as minister plenipotentiary to Gran Colombia, Harrison resigned from Congress and served in his new post until March 8, 1829. He arrived in BogotÃ¡ on December 22, 1828. He found the condition of Colombia saddening. Harrison reported to the Secretary of State that the country was on the edge of anarchy and he thought SimÃ³n BolÃ­var was about to become a military dictator. While minister in Colombia, Harrison wrote a rebuke to BolÃ­var, stating "...Â the strongest of all governments is that which is most free". He called on BolÃ­var to encourage the development of a democracy. In response, BolÃ­var wrote, "The United States ... seem destined by Providence to plague America with torments in the name of freedom", a sentiment that achieved fame in Latin America. When the new administration of President Andrew Jackson took office in March 1829, Harrison was recalled so they could make their own appointment to the position. He returned to the United States in June. After Harrison returned to the United States in 1829, he settled on his farm in North Bend, Ohio, his adopted home state. There, he lived in relative retirement after nearly 40Â years of continuous government service. Having accumulated no substantial wealth during his lifetime, he subsisted on his savings, a small pension, and the income produced by his farm. Harrison cultivated corn and established a distillery to produce whiskey. After a brief time in the liquor business, he became disturbed by the effects of alcohol on its consumers, and closed the distillery. In a later address to the Hamilton County Agricultural Board in 1831, Harrison said he had sinned in making whiskey, and hoped that others would learn from his mistake and stop the production of liquors. Harrison was the Whig candidate (and again faced Van Buren, now the incumbent president) in the 1840 election. The Whig party unified behind a single candidate, and Harrison was chosen over more controversial members of the party, such as Clay and Webster. Harrison based his campaign on his heroic military record and on the weak U.S. economy, caused by the Panic of 1837. In a ploy to blame Van Buren for the depressed economy, the Whigs nicknamed him "Van Ruin". The Democrats ridiculed Harrison by calling him "Granny Harrison, the petticoat general", because he resigned from the army before the War of 1812 ended. When asking voters whether Harrison should be elected, they asked them what his name backwards was, which happens to be "No Sirrah". Democrats cast Harrison as a provincial, out-of-touch old man who would rather "sit in his log cabin drinking hard cider" than attend to the administration of the country. This strategy backfired when Harrison and his vice presidential running-mate, John Tyler, adopted the log cabin and hard cider as campaign symbols. They used the images in banners and posters, and created bottles of hard cider that were shaped like log cabins, all to connect to the "common man". When Harrison came to Washington, he wanted to show both that he was still the steadfast hero of Tippecanoe, and that he was a more learned and thoughtful man than the backwoods caricature ascribed to him in the campaign. He took the oath of office on March 4, 1841, a cold and wet day. He wore neither an overcoat nor hat, rode on horseback to the ceremony rather than in the closed carriage that had been offered him, and delivered the longest inaugural address in American history. At 8,445 words, it took him nearly two hours to read, although his friend and fellow Whig Daniel Webster had edited it for length. Harrison then rode through the streets in the inaugural parade, and that evening attended three inaugural balls, including one at Carusi's Saloon entitled the "Tippecanoe" ball, which at a price of US$10 per person (equal to $229 today) attracted 1000 guests. As leader of the Whigs and a powerful legislator (as well as a frustrated Presidential candidate in his own right), Clay expected to have substantial influence in the Harrison administration. He ignored his own platform plank of overturning the "Spoils" system. Clay attempted to influence Harrison's actions before and during his brief presidency, especially in putting forth his own preferences for Cabinet offices and other presidential appointments. Harrison rebuffed his aggression, saying "Mr. Clay, you forget that I am the President." The dispute intensified when Harrison named Daniel Webster, Clay's arch-rival for control of the Whig Party, as his Secretary of State, and appeared to give Webster's supporters some highly coveted patronage positions. Harrison's sole concession to Clay was to name his protÃ©gÃ© John J. Crittenden to the post of Attorney General. Despite this, the dispute continued until the president's death. Clay was not the only one who hoped to benefit from Harrison's election. Hordes of office applicants came to the White House, which was then open to all comers who wanted a meeting with the President. Most of Harrison's business during his month-long presidency involved extensive social obligationsâ"an inevitable part of his high position and arrival in Washingtonâ"and receiving visitors at the White House. They awaited him at all hours and filled the Executive Mansion. Harrison wrote in a letter dated March 10 that "I am so much harassed by the multitude that call upon me that I can give no proper attention to any business of my own." Nevertheless, Harrison sent a number of nominations for office to the Senate for confirmation during his month in office. The new 27th Congress had convened an extraordinary session for the purpose of confirming Harrison's cabinet and other important nominees; since a number of them arrived after Congress' March 15 adjournment, however, John Tyler would ultimately be forced to renominate many of Harrison's selections. Harrison's only official act of consequence was to call Congress into a special session. He and Henry Clay had disagreed over the necessity of such a session, and when on March 11 Harrison's cabinet proved evenly divided, the president vetoed the idea. When Clay pressed Harrison on the special session on March 13, the president rebuffed his counsel and told him not to visit the White House again, but to address him only in writing. A few days later, however, Treasury Secretary Thomas Ewing reported to Harrison that federal funds were in such trouble that the government could not continue to operate until Congress' regularly scheduled session in December; Harrison thus relented, and on March 17 proclaimed the special session in the interests of "the condition of the revenue and finance of the country". The session was scheduled to begin on May 31. Harrison's doctors tried cures, applying opium, castor oil, leeches and Virginia snakeweed. But the treatments only made Harrison worse, and he became delirious. He died nine days after becoming ill, at 12:30Â a.m. on April 4, 1841. Harrison's doctor, Thomas Miller, diagnosed Harrison's cause of death as "pneumonia of the lower lobe of the right lung", but a 2014 medical analysis concluded that he instead died of enteric fever. The authors base their findings on the president's symptoms and the close proximity of the White House to a dumping ground for sewage and human waste. He was the first United States president to die in office. His last words were to his doctor, but assumed to be directed at John Tyler, "Sir, I wish you to understand the true principles of the government. I wish them carried out. I ask nothing more." Harrison served the shortest term of any American president: March 4Â â" April 4, 1841, 30 days, 12 hours, and 30 minutes. Harrison's death revealed the flaws in the constitution's clauses on presidential succession. Article II of the Constitution states that "In case of the removal of the President from office, or of his death, resignation, or inability to discharge the powers and duties of the said office, the same shall devolve on the Vice President ... and [the Vice President] shall act accordingly, until the disability be removed, or a President shall be elected". Scholars at the time disagreed whether the vice president would become president or merely Acting President. The Constitution did not stipulate whether the vice president could serve the remainder of the president's term, until the next election, or if emergency elections should be held. Harrison was the first sitting president to have his photograph taken, on Inauguration Day in 1841. There are extant photographs of John Quincy Adams, Andrew Jackson, and Martin van Buren; however those images were all taken after these men had ceased to be president. The Harrison image was also the first of these photographs to be taken. The original daguerreotype, made in Washington on his Inauguration Day, has been lostâ"although at least one early photographic copy exists in the archives of the Metropolitan Museum of Art. Harrison's chief presidential legacy lies in his campaigning methods, which laid the foundation for the modern presidential campaign tactics. Harrison died nearly penniless. Congress voted to give his wife a Presidential widow's pension, a payment of $25,000, one year of Harrison's salary. This is equivalent to $571,532 today. She also received the right to mail letters free of charge. Harrison's son John Scott Harrison served in the U.S. House of Representatives from Ohio between 1853 and 1857. Harrison's grandson, Benjamin Harrison of Indiana, was the 23rd president, from 1889 to 1893, making them the only grandparentâ"grandchild pair of presidents. Three schools were named William Henry Harrison High School (in Evansville and West Lafayette, Indiana and Harrison, Ohio) in his honor. During the American Civil War, the Union Army named a post near Cincinnati Camp Harrison., and a military fort in Montana was named for him. Because of his short service, no military vessel was named after him as president. A statue of Harrison was erected on Monument Circle in Indianapolis. Additionally, Harrison is shown (on the left, facing the building) in a pediment on the Tippecanoe County Courthouse, Lafayette, Indiana, 1882.